Boulder County embraces within its boundary lines an area of 786 square miles in the form of a parallelogram about 32 by 24 miles extent. The western two-thirds consists chiefly of mountains, which run chain-like ridges westerly direction towards the Continental Divide, and tower up to an altitude of 13,000 feet and more. In these mountains are found a number of metals which have added much to the wealth and fame of Boulder County. Coal measures underlie practically all of the eastern third of the county, and are of great extent and value. They lie regularly and in the main quite horizontally except close to the mountains, where they are naturally tilted. This county is a part of the so-called Northern Colorado Coal field, which includes the following counties in addition to Boulder: Adams, Jefferson and Weld. The coal veins are found at a much greater depth in the northern part of this cool area, and for this reason little mining has been done there. Most of the coal now being mined is found at depths not exceeding two hundred feet. The veins now considered workable range from four to sixteen feet in thickness. Some of these veins are of constant thickness over wide areas, while others vary greatly in thickness within a small area. Boulder County coal ranks as sub-bituminous, though from its chemical composition it allies self quite closely with bituminous. It is free-burning, easily ignited, comparatively free from impurities, and much liked for general use in Denver and outside markets. Its analysis shows from 26 to 57 per cent fixed carbon and about 33 per cent volatile matter, the balance being largely moisture and ash. Since much of the coal contains 15 to 20 per cent moisture, it has very poor storage qualities, consequently little is mined during the summer months when the demand os very low. As will be shown later, this adds greatly to the problem of unemployment. The first settlers of Boulder County found outcrops of coal which they early began to appropriate for domestic heating purposes. The first real mines to be developed in the county were probably the Marshall coal mines, situated about five miles southeast of Boulder. It is thought that coal was first mined in this locality as early as 1860. In 1864, Joseph W. Marshall and three other men from Black Hawk, who owned the Marshall mines, erected a small blast furnace at Marshall and made 200 tons of pig iron from the red hematite ores which were found in that locality. However these mines were only worked on a small scale because the chief demand for coal came from farmers and other residents of Boulder City. After the building of the Golden, Boulder & Caribou railroad in 1878, the output of these mines doubled. In October 1879, Welch sold to Jay Gould, the great railroad operator. Later the Colorado Central and Kansas Pacific railroads acquired the property. Another important early coal mining center in Boulder County was Canfield, located on the Denver & Boulder Valley railroad in the extreme eastern part of the county. In 1880 there were two valuable coal mines here — Star and Jackson. The latter was formerly the Rob Roy. The Star mine produced over 20,000 tons of coal in 1879. At this time Jay Gould opened a mine on his purchase of land adjoining the Star and Jackson mines. Two other mines, the Stewart and the Superior, were located one and one-fourth miles southeast of these mines. The thickness of the coal veins in the Canfield area average six feet, and 1880 annual production reached a total of nearly 250 tons. 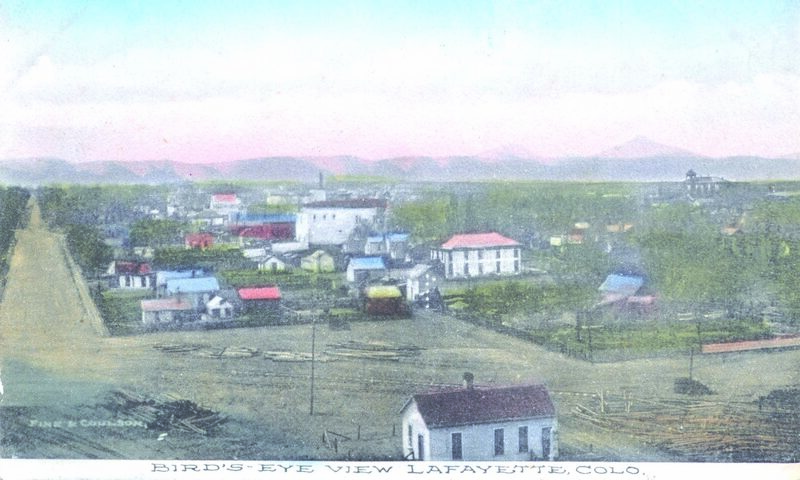 Lafayette, which soon became another important coal mining town in Boulder County, was platted in 1888. The Simpson was one of the first coal mines to be opened here, remaining a good producer from 1888 to 1926. Late in 1888, the old Welch mine, near Louisville, was reopened upon the discovery pf a new slope of coal about 800 yards the the southeast of the old shaft. The Standard mine in eastern Boulder County was also put in condition and produced steadily. As a result of these new developments, in 1888 Boulder County reached a new high in coal production. Boulder County reached an all-time high in 1909, when about one and one-third million tons were produced. Since that time the secular trend has shown a decline with yearly production moving up and down with the vicissitudes of the business cycle. Never since the year 1920 has production attained a total of over one million tons. Even during the Second World War period, production failed to reach former high levels, although there was a considerable increase, which reached its highest peak in 1942. During the war period just passed, the total value of coal produced in Boulder County increased while the value of most other minerals decreased. For example, the value of coal mined in 1944 was more than $2,000,000, while that of gold decreased to only $32,480. It is quite evident that coal has never been given the recognition it deserves, either in the economy of Colorado or of Boulder County. Volume after volume has been written about the mining of gold, while scarcely anything has been said of coal. Coal — the black, dirty, non-glamorous mineral of the Colorado plains — is much more important to the present and future of both the state of Colorado and Boulder County than any other mineral, with the possible exception of crude petroleum. Excerpts of “Some economic aspects of the coal industry in Boulder County, Colorado,” Maynard A. Peck, dissertation for Ph.D., University of Colorado, 1948. Reprinted from the July 11, 1947, Longmont Times-Call.